Superman is the most iconic person within the comic book genre because of his impressive powers and brightly colored superhero suit. He was the first superhero to wear a symbol on his chest, and this design later become a common identification method for superheroes everywhere. The red and yellow Superman logo has existed for decades, but it took a little while for the iconic S emblem to reach its modern incarnation. In this article, we will take a look at how the Superman logo has changed over the years and view the way it has influenced other superhero logos. The logo is a five sided shape with a flat top and a pointed bottom that looks similar to the icon for a diamond. It is topped with a wide line with a short line on either side that connect to the two longer lines along the bottom of the logo. At the middle of the logo is a thick, red S is skewed to fit within the outline of the logo shape. Both the letter and the edge of the Superman logo are in red, which is outlined in black. The rest of the logo is filled in with a bright yellow background. 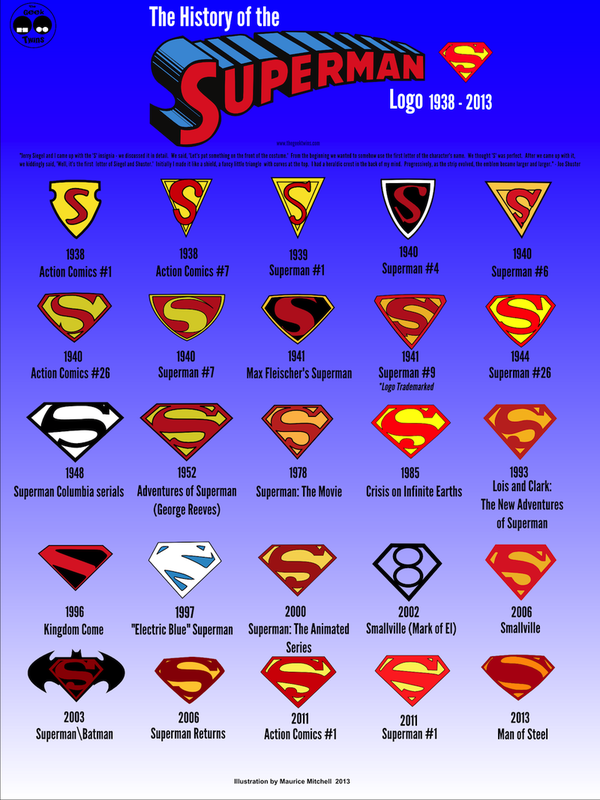 Over the years, there have been many changes to the shape of the Superman logo. In Superman’s first appearance in 1938, his logo was drawn as a yellow, shield-shaped police badge with a red S. For the next several editions, comic book artists varied the way they drew the logo. It was typically just a triangle with an S over it. In 1940, this was turned into a diamond shape for the first time. The diamond with an S in it has remained the basic logo shape since the 40s. Since his creation, Superman has almost always worn a red and yellow logo. For the first few comics, his logo went back and forth between being red on yellow and yellow on red. When it was first drawn in the diamond shape, it briefly changed to a red S on a black diamond outlined in yellow. In 1948, the logo was a black S on a white background for a single series. It also changed to red on black for one series in 1996. The most significant color change was the white on blue color when Superman briefly gained electronic powers. Despite these occasional deviations, the logo always returns to its classic color scheme. The S in the logo is always a custom design, not any specific font. Its style does tend to change a bit depending on who is drawing Superman. Sometimes the S is so rounded that it looks like a figure 8, and sometimes it is an angular slash of three lines. The colors of the logo were chosen just because it was easy to print red and yellow on old-fashioned presses, and the bold colors suited Superman’s character. His creators chose an S just to symbolize his name and make him more recognizable, and the diamond was a representation of his impenetrable skin. The influences behind Superman’s logo may be relatively simple, but it went on to inspire many other artists. Countless other superheroes, including Batman, Wonder Woman, Spider-Man, the Flash, and Green Lantern went on to have some sort of representative logo on the chest of their costume. The shapes of the logo were even used to create the new DC Comics logo as an homage for their most popular character. Superman’s logo is mostly associated with the comic books, but his iconic logo was first created for a cartoon serial that ran for a short time in the forties. Many versions of the logo contain a barely noticeable curve across the top to emphasize Superman’s muscular physique. The 1978 Superman film retroactively changed the meaning of the logo when it claimed that the S symbol is actually the House of El’s family crest which just coincidentally looks like an English S.
The Superman logo frequently appears on Superman’s chest, but it also shows up on a variety of shirts, hats, and even household goods. As one of the most recognizable comic-book logos, this symbol is a wildly popular image. At this point in time, the Superman logo has become so iconic that no artist would dream of altering it too much. The logo will most likely continue to face minor alterations, but its key design elements will remain consistent.